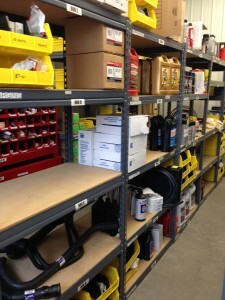 At MBS Fleet Repair we have our own Parts Department fully stocked with a variety of automotive parts. Having our own Parts Department is a benefit to you as a customer. Since we carry many parts in stock, we are able to spend more time working on your vehicle and getting it to you sooner. We carry well-known, good quality parts such as AC Delco, Braun, Sho-Me and many others. We take pride in our customers and our quality of work, that is why we feel it is important to have a high quality of parts in stock. We don’t have everything in stock, but if we do not have it in stock, we can always get it. Most of our parts are sold within MBS Fleet Repair, but we do sell to other businesses and individuals looking for specific parts. Since we are a specialized dealer able to service Wheelchair Lifts, Cryogenic Oxygen Tanks, Ariel Booms and other specialty fleet services, our parts department often has an inventory unlike any other area parts department. Call MBS Fleet Repair and ask for Darryl, our Parts Manager, at (765) 284-1372.